Svarshik: The landmark on the roadside marking the beginning of the Golan Heights. 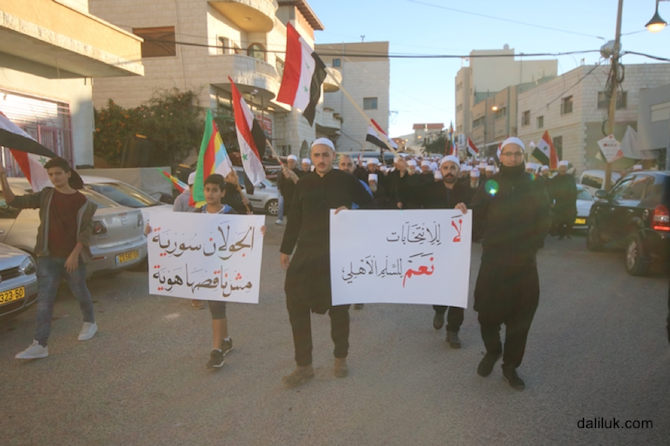 On the morning of 30 October 2018, the Jawlanis (Syrian residents of the occupied Golan Heights) carried out a significant act of protest, with hundreds blocking polling stations against yet another Israeli attempt to normalise its occupation/annexation of the area by pushing for a ‘democratic’ local council election. 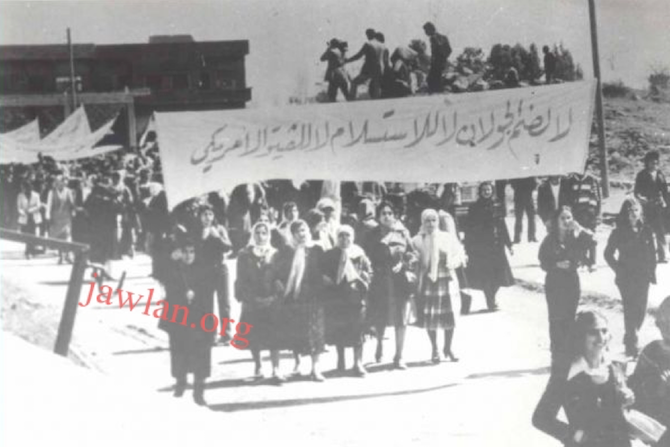 Since 1967, the Jawlanis (mostly Druze Arabs), have refused to participate in the elections of their local councils. The Israeli government has therefore been appointing heads of village councils and municipalities in the four remaining Jawlani villages. The appointees must have Israeli citizenship, which most of the Jawlanis have refused to acquire. This refusal stems from a myriad of tactics, convictions and beliefs which the Jawlanis consolidated to confront efforts by the Israeli state to impose an annexation on them and their land. Although there has been a rise of Jawlanis who have acquired Israeli citizenship through marriage to Israeli Druze or through applying for it, especially after the Syrian war, the numbers are estimated to make up only 20% of the total population of 27,000. Similar actions were seen in Jerusalem. Palestinian residents of Jerusalem, who like the Jawlanis have no Israeli citizenship but only residency permits, have for decades refused to participate in an election which they think only acknowledges and normalises the Israeli occupation and its policies. This has resulted in the de-development and fragmentation of the city, its residents and its Arab Palestinian character. Common conditions of dispossession, displacement and control further strengthen historical and contemporary solidarity actions carried out between Jawlanis and Palestinians. These Israeli enforced elections on the Jawlan (Golan) were met with the same fervour and opposition of the 1981 unilateral Israeli decision to annex the Golan Heights and impose Israeli citizenship on its Syrian residents, a move stated by the United Nations Security Council (Resolution 497) to be null and void. Following this de facto annexation, the Israeli government implemented its civil law in the occupied areas and continued with its intensive settlement and resource expropriation. The 1981–82 events of the Great Strike are etched in the memory of young and old Jawlanis as a process of transformation and collective action victory, solidifying their refusal of Israeli citizenship. The six months strike in 1982 was a monumental event experienced by the small population residing in four villages in the Northern Golan Heights. The banners and chants raised highlighted that the Jawlan is Arab and Syrian and so are its remaining residents. Fast forward 36 years to 2018, scenes of mobilisation and peaceful dissent against the imposed elections bring back memories of the struggle of the older Jawlani generation. Our project, Mapping Memories of Resistance, aims to historicise and politicise the backdrop of current events and their legacy in halting the enforced Israelificiation of the occupied Jawlan, which is reflected by a deeper and longer process of mobilisation of an isolated community in the face of Israeli occupation. The project, a collaboration between the LSE Middle East Centre, Birzeit University and Al Marsad, Arab Human Rights Centre in Golan Heights, aims at utilising maps, testimonies and archives to tell the story of the Jawlani resistance through the lens of social history, offering a bottom-up approach to a highly securitised and politicised area. 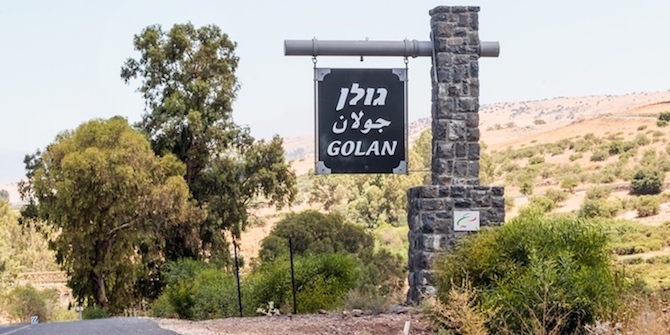 The Golan Heights has had its share of geostrategic and political analysis by scholars, mainstream media and spectators alike, but its remaining populations, their everyday struggles and mobilisation are all still understudied and side-lined. The LSE–BZU partnership project aims at overcoming this lack of attention to lived geographies in the occupied Golan Heights and sets out to compile decades of community-led archives, testimonies and reports into a single database, which will be easily accessible, visually rich and empirically grounded with people’s stories of living under a forgotten occupation. The project also aims to extend its outreach to the young generation of Jawlanis to include them in the narration and documentation of their own experiences through a deeper exploration of processes of mobilisation and non-violent resistance established by the older generation. This will also allow academic and intellectual debates between Palestinian and Jawlani students on issues of identity, resistance and political mobilisation. These processes continue to have effects on the Jawlani population until this day. Since 1967, the population has been coping with transformative conditions that have systematically confined Syrians in the Jawlan to less than 7 percent of the land, restricting their access to and control of essential resources such as water and refusing to acknowledge the Jawlanis Syrian identity. Continuity therefore characterises the conditions under which the Jawlanis experience Israel’s policies of exclusion. Change, nevertheless, is also a recurring feature in the life of the Jawlani; forcing the population to devise adaptive tactics and actions which come to shape the unique identity of the Jawlanis today. A hybrid reality of non-violent resistance and conformity characterises the conditions under which Jawlanis practice their everyday. *This blogpost introduces the LSE Academic Collaboration project Mapping Memories of Resistance: The Untold Story of the Occupation of the Golan Heights run in collaboration with Birzeit University, which aims to document and narrate the untold story of the occupation of the Syrian Golan Heights in its political, socio-economic and cultural elements. Muna Dajani is Research Officer on the project.